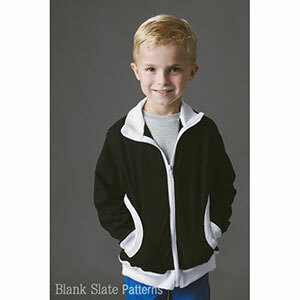 The Zippy Jacket is a knit fabric unisex jacket featuring: Rib knit bound circle pockets, zip front, collar that can be worn up or down, ribbed cuffs and waist that can be made of contrasting fabric. 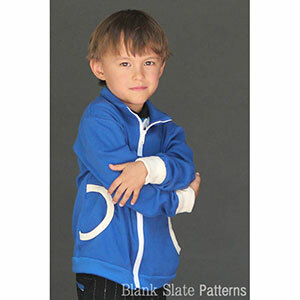 This is the children's version of the Zinnia Jacket. Sizes 18 months through 8 years. Sizes are matched to standard separating zipper sizes. 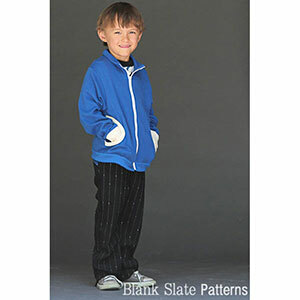 Suggested fabrics are mid to heavy weight interlocking knit fabric. Rib knit for the cuffs and waist.